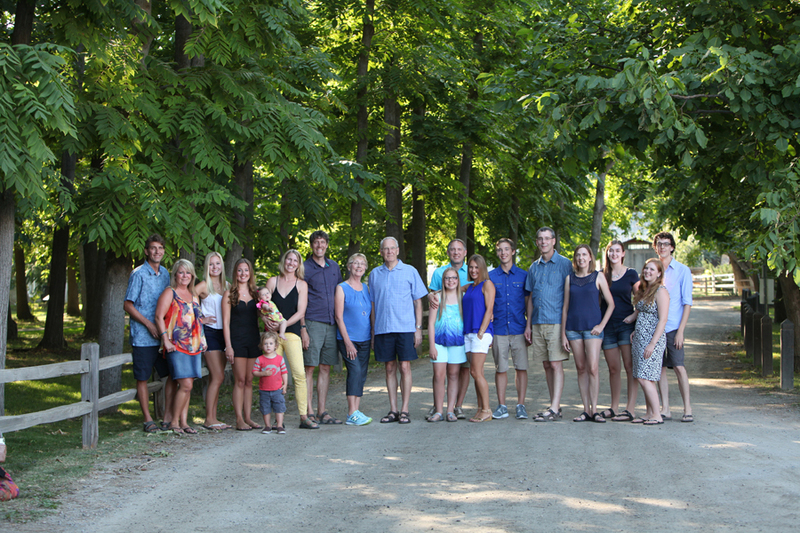 During the summer months, I am frequently asked to photograph large family groups of 15 or more people. These families are most often gathered together here in the Okanagan for a family reunion or event. What a great time to do a family portrait! Planning for your family photo shoot is key. Hire your photographer as soon as you begin planning your event as many photographers book early in the summer months. Choosing the best time of day for your family members will ensure a successful shoot. Sunset is often best for large groups to avoid harsh sun and to take advantage of the beautiful soft sunset light. However, a sunset shoot is not always possible if children are involved who get tired early. Set aside a minimum of 1.5 hours for your session. During our initial consultation, I help people decide on a location. If the prefered location is at a family member’s home, I will plan to visit the home briefly before the shoot to make sure it will work. Visit my blog posts Studio vs Location Photo Shoots and Is your Home a Good Location for a Photo Shoot to help you decide on a photo shoot location. Choose a location that is easily accessible, especially, if there are elderly people and young children involved. You may decide to choose a park or resort where family is staying. During the consultation, I will also talk to you about wardrobe. Keep in mind, it is not easy to coordinate large numbers who are all coming from different places. It is often best to keep it simple. I tell people to choose one colour pallet such as earth tones. You don’t have to worry about matching exactly. I also will talk to you about different breakdowns of groups. It is important to think this through before hand so that important photos are not missed. I do my best to work with my families to create a fun experience that adds to their time together.